Apparently satisfied with the successes recorded by the Lagos Channel Management and the Bonny Channel Management in Lagos and Calabar respectively, the Federal Government has given nod for the establishment of Calabar Channel Management (CCM) to guarantee the sustainability of the Channel. The Minister of Transport, Senator Idris Umar who made this known while declaring open the 12th Inter-modal Africa 2014 Exhibition and Conference in Lagos Thursday reiterated the federal government’s commitment towards the resuscitation of the Calabar Access Channel which he said was a joint venture between the Nigerian Ports Authority (NPA) and Messrs Niger Global Limited. The Minister also disclosed that the dredging of the River Benue is currently being processed for final consideration and approval by the federal government stressing that the dredging would guarantee the sustainability of the Lower River Niger Channel and expand the Nation’s inland waterways. The Minister also disclosed to the gathering that the process for the concession of the Onitsha Port to a private operator with a transactional Adviser appointed to midwife the process was in progress. On his part, the Managing Director, Nigerian Ports Authority (NPA), Mallam Habib Abdullahi urged the local investors to use the forum to strategize and network adding that the event which was coming to Nigeria for the first time was to create a platform for local investors to meet, interact and network. “The event which is organized for the first time in Nigeria is an initiative designed for local investors to meet, interact and network with each other”, Abdullahi said. Abdullahi further said that the concessioning of the ports to private investors in 2006 has helped to develop the Nigeria Ports even as he noted that prior to concessioning, infrastructure at the various ports were deteriorating due to poor maintenance culture. As he said it, “due to lack of maintenance of Ports infrastructure, the Quay wall at the Ports were collapsing with inadequate cargo handling equipment and delay in turn around of vessels. But consessioning the ports to private investors solved the problems of infrastructural decay in the ports with cargo throughput increased. Also, we created competition among the concessionaires and since the ports were concessioned, the cargo turn around time has reduced to how it was before”. He also said that partnership with foreign companies has made big ships berth at the various Terminals. “We collaborated with Lagos Channel Management and the Bonny Channel management to dredge our channel for bigger ships to come in. The success of the two Channel Managements have made us give go ahead for the establishment of the Calabar Channel Management in Calabar,” he said. The event is the biggest and the most established Bi -Annual Container Ports, Shipping and Transport Logistic exhibition and conference in Africa taking place for the first time in Nigeria. 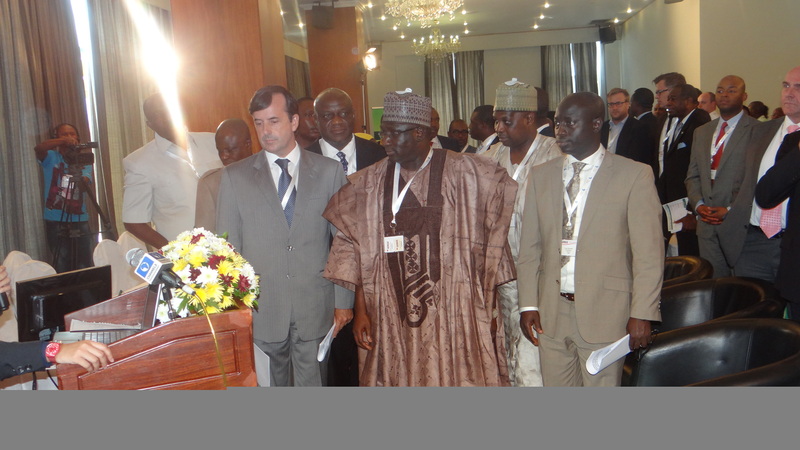 The conference which witnessed the participation of four continents cutting across 22 countries was aimed at improving the inter-modal and cross border logistics in the whole of Africa. The bi- annual conference also creates enabling environment for the world best developers and manufacturers of plants, equipment and transport industry data solution providers to network, market and promote their services.